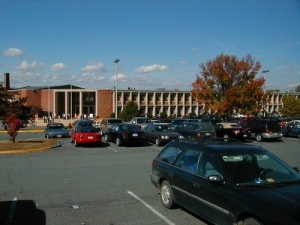 Albemarle High School is an Albemarle County public high school. Albemarle is part of the Northern Feeder Pattern. Albemarle students attended Burley Middle School, Jack Jouett Middle School, or Sutherland Middle School. As of 2017 Albemarle has 1,992 students enrolled and employs almost 150 teachers and 70 staff members. Albemarle High School opened in 1950 to almost 850 students. Adjacent to Greer Elementary School and Jouett Middle School, the school has undergone multiple renovations and expansions since 1950. In 2009 Albemarle added a new Math, Engineering & Science Academy directed towards students with an interest in engineering or design. In 2014, Albemarle implemented a "Fine Arts Pathway" that allows students to organize their electives to focus on a particular area of the arts throughout their high school career. Students can choose from art, ceramics, photography, band, orchestra, chorus, creative writing and theatre. Each strand, or area of focus, is composed of five traditional classroom courses, a community learning experience, an internship, and a capstone project. In 2008 the Virginia Department of Environmental Quality installed an ambient air monitoring station at AHS. The system is designed to measure particles in the air smaller than 2.5 micrometers, ozone levels, and collect meteorological data in the area. The current principal of Albemarle High School is Jesse Turner. Albemarle High School is located at 2775 Hydraulic Road. ↑ 1.0 1.1 1.2 Web. Albemarle High School Profile, Albemarle County Public Schools, retrieved June 1, 2012. ↑ Web. Albemarle High School to offer artistic focus, Tim Shea, Charlottesville Tomorrow, Charlottesville, VA, April 17, 2014, retrieved April 17, 2014. ↑ Web. Ambient Air Monitoring Station, Albemarle County Public Schools, retrieved July 2, 2012. This page was last edited on 15 August 2018, at 16:40.